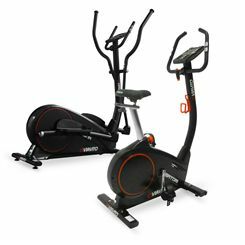 Comprising two low-impact, high-intensity cardio machines, the package provides a safe, up-tempo aerobic workout to let you work just about every major muscle group. Offering natural, fluid motion, a great choice of workout programmes and silent magnetic resistance, the package helps to reach a calorie deficit, improve your heart health and bring down blood pressure. Both machines are fitted with a clear backlit LCD display with a convenient KM/MI switch and 4 user profiles for personalised feedback. 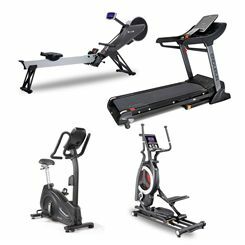 Ample stability, the quietest, most consistent feeling and great functionality, these solid pieces of gym equipment will make your sessions enjoyable and effective. 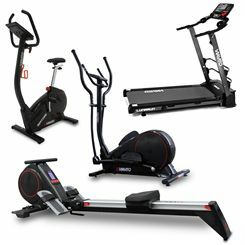 If you are looking to create your own home gym or you know that the key to a successful fitness regime is a varied workout schedule, then you are probably looking for more than one piece of fitness equipment. 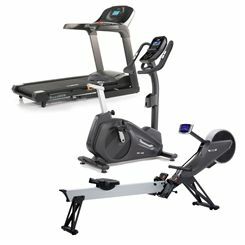 And you’ve come to the right place here at Sweatband.com as we are dedicated to ensuring our customers get the right equipment for their needs. 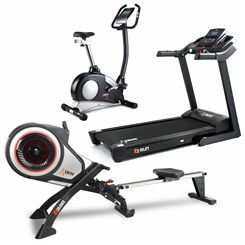 On this page you’ll find a selection of fitness packages to suit different needs and budgets, from entry level options costing as little as £449 right up to premium deals with top-of-the-range machines, with plenty in between as well. Whether you want to get more active at home, are a regular exerciser or are training for various sporting events, there will be a fitness package to suit. 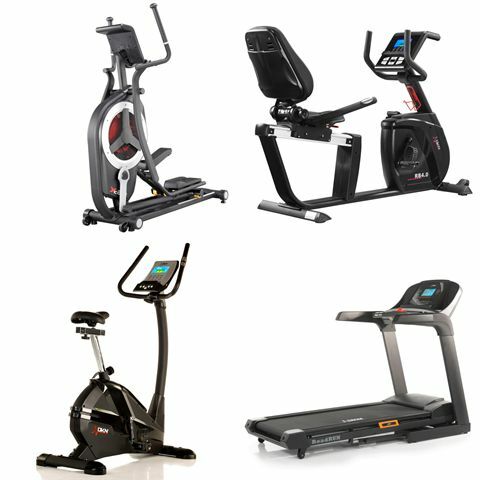 Each fitness package contains two or more exercise machines designed to give you a great home workout experience. So if you’re swapping the gym for exercising at home, we’ve got some top options to help you do so in comfort and style, and hassle free! Our package deals cover all bases, with options that include different combinations of treadmills, elliptical cross trainers, rowing machines and different types of exercise bikes, such as upright bikes, recumbents and indoor cycles. The packages are also grouped by brand, so you can purchase a range of machines from the same manufacturer. 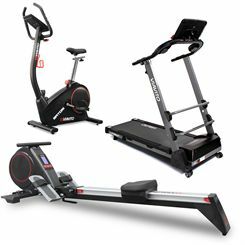 You can filter the exercise machine packages by brand, price or level, with different levels for different user needs and suiting varying amounts of usage. Our packages feature a variety of fitness equipment combinations carefully selected by our specialists to offer you the widest range of exercises within your budget. However, don’t worry if you don’t see the exact product combination you are looking for. 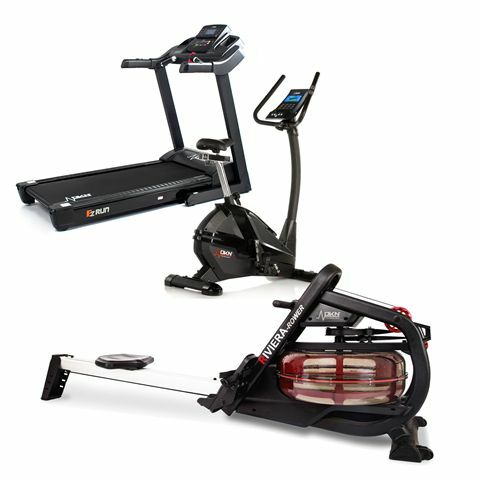 We are more than happy to ‘tailor-make’ a fitness machine package to suit your specific requirements. Simply give us a call and an advisor will be able to talk through your needs and expectations and provide you with some suitable options to match. All the machines we sell come with free delivery to most UK mainland addresses, via a specialist 2-man service to make sure that your products arrive safely. Our customer service team will arrange the delivery date so it suits you, with availability on most working days. We also offer installation services, just enquire with us and we’ll be happy to help get you set up and using your equipment straight away.